A couple posts ago I wrote about Leafy Spurge, and in the header photo there was a beetle on the plant. The beetle is a Spotted Lady Beetle, Coleomegilla maculata, one of our 481 native species of lady beetles. 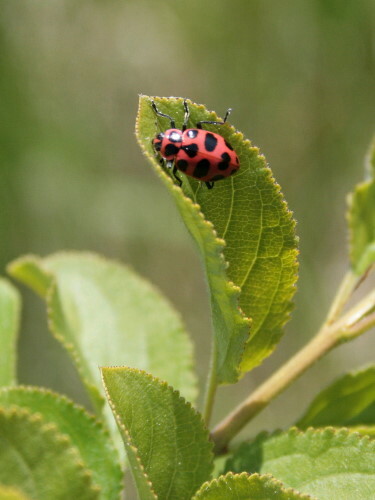 It’s found through most of the east, and is probably the most common lady beetle in our part of the continent. Most lady beetles are predaceous, feeding primarily on aphids but also taking other invertebrates as available. However, Spotted Lady Beetles are somewhat unique in that, because they’re out relatively early in the season, they will supplement their diet with pollen (dandelion is a favourite; another reason to leave them be in your lawn). Many native lady beetles are slowly declining and disappearing across much of North America. Competition with the introduced Asian Multicolored Lady Beetle is probably a factor in this trend, but the increasing application of pesticides and herbicides to our crops (including our grass crop that most of us maintain around our homes) is probably also part of the reason. The Lost Ladybug Project, organized by the Department of Entomology at Cornell University, is a citizen science project that aims to track the occurrence of our native lady beetles through the submission of photos taken by people like you, allowing ladybugs to be found and tracked from more parts of the continent than if it were just simply Cornell staff going out to look. It’s as easy as looking for ladybugs, taking a photo, and uploading your photo using their online submission form. For more information on participating, or to upload a photo you’ve taken, visit the Lost Ladybug Project’s website. If you’re in Ohio, the Ohio State University runs a similar program for that State: check out the Buckeye Lady Beetle Blitz. Very informative post. 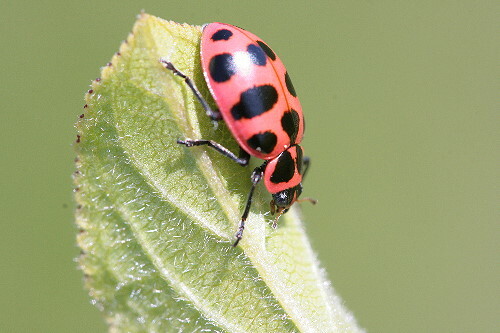 I will be on the lookout for the Spotted Lady Beetle and if I find one I will send a photo off to Cornell. I have noticed that they seem to have disappeared in my neck of the woods. Here, the Asian lady bugs are found by the thousands — especially in early fall. — barbara. Beautiful pictures of a beautiful insect!